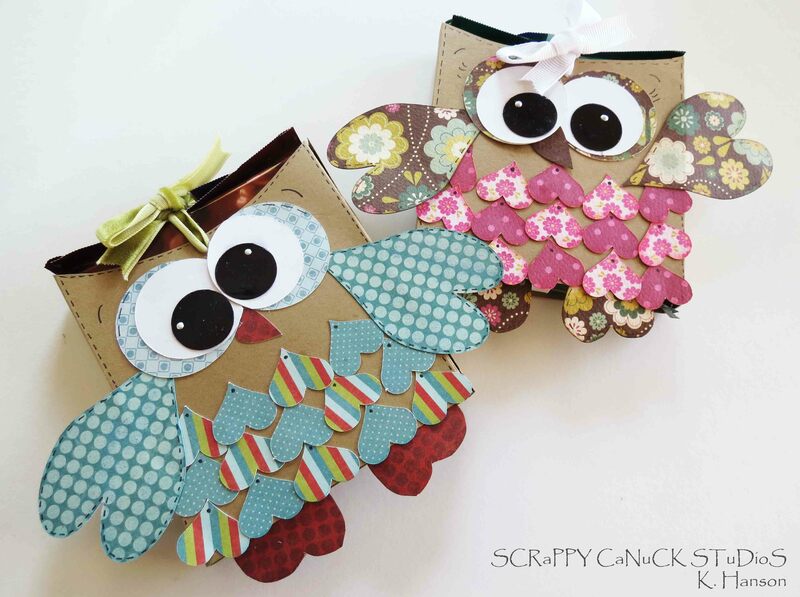 Before I started scrapbooking and chatting with crafters all over the world, I had no idea there were so many owl fans! I agree that there is something endearing about these little creatures, and their cute sound is full of sentiment potential! So this month, in honour of all of my CropChocolate friends who are fans of owls, I decided to team up owls and chocolate! Oh, and few hearts too! 2. On the front, top edge of your wrapper (the widest section), cut out a half moon shape that runs from one side to the other. 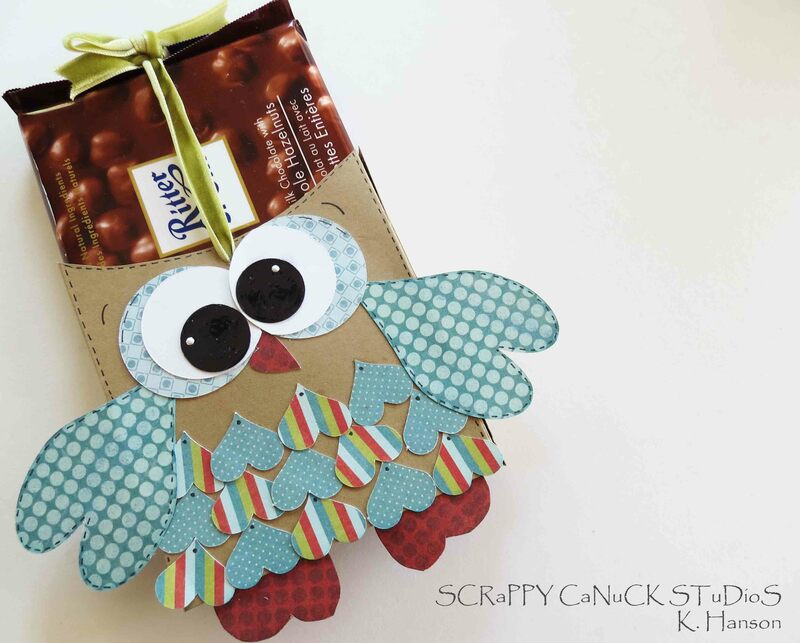 This will give your wrapper an “owl shaped” head. 3. On the same top edge, find the middle and measure down about 1/4″. 4. Press the front section down so that it lines up with the back section and punch a hole at the marked location, making sure the hole goes through both sections. 5. Measure out a piece of ribbon that is 4X the height of your wrapper. If you are using a Ritter Sport bar, your ribbon would need to be 12″ in length. 6. Thread the ribbon from the front section through to the back section. Center the ribbon so there are equal amounts sticking out the front and the back. 7. Place your candy bar in the wrapper, pushing the ribbon down as you insert it into the wrapper. Tie a bow at the top. Your candy bar should now slide up and down into the wrapper when you pull up on the ribbon. 1. Cut out at least 15 1/2″ hearts. Apply the hearts upside down with adhesive starting at the bottom edge of the wrapper and working your way up – 3 rows of 5 hearts. Adjust according to your candy bar dimensions. 2. Cut out 2 hearts that are at least 2″ in height. Apply upside down on the side edges of your wrapper for wings. 3. Cut out 2 – 1″ hearts and attach to the bottom edge for feet. 4. 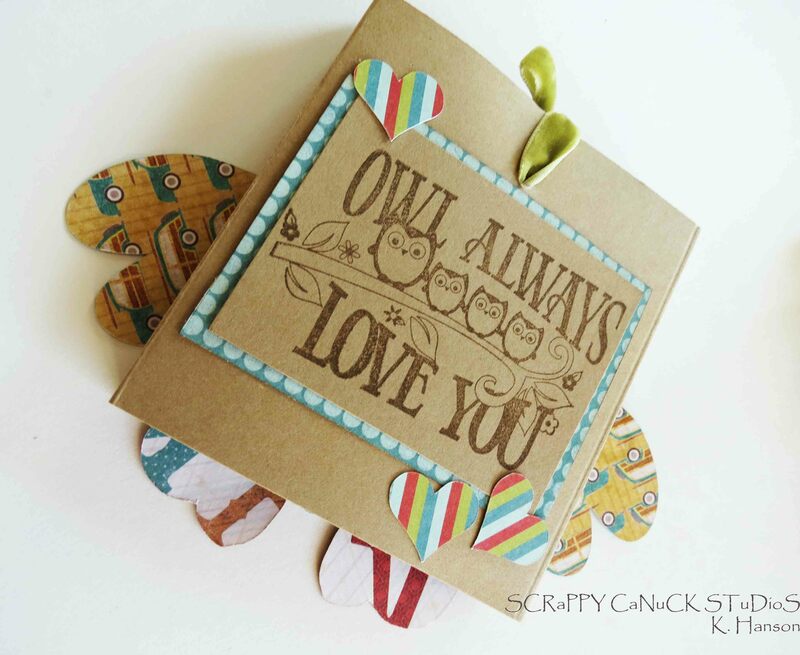 Cut out 1 – 1/2″ heart and attach as a beak. 5. Using overlapping circles, cut out eyes and adhere to wrapper. 6. If desired, add a message to the back of the wrapper. This entry was posted in CropChocolate Projects, General crafts, Tutorials, Video Tutorials and tagged candy bar, crop chocolate, my mind's eye, slider, tutorial by Scrappy Canuck. Bookmark the permalink. ADORABLE!! What a great idea!!! Thanks belle! These cuties were really so much fun to make! Hi Sheri – I actually used my cricut to cut them out. It was just the simple Plantin Schoolbook heart cut to 3/4″. Hope that helps! Darling!! Thank You for sharing your GREAT ideas!! You are most welcome! I am so glad you like the idea, and thanks for taking the time to post! This is owl-dorable!!!! Love love love it!!! Thanks alicecarman! I am glad you like it! Thanks for taking the time to comment!